African Blue Lily brings you closer to a unique concept of accommodation and tourism: creative, individual and warm and familiar, different and modern. Here you will find the perfect combination of nature and comfort in a private two-bedroom wooden house surrounded by nature and just minutes from Sintra, Cascais, Lisbon and our beautiful coastline. African Blue Lily Farm offers personal activities to make your stay even more enjoyable! Beautiful and cosy wooden house (more like a home actually) with 1 suite, 1 bedroom, 1 bathroom and an open space with living room and kitchen. Surrounded by the tranquility that only nature can offer, it is ideal to spend a nice time as a family or a group of friends in a family environment. 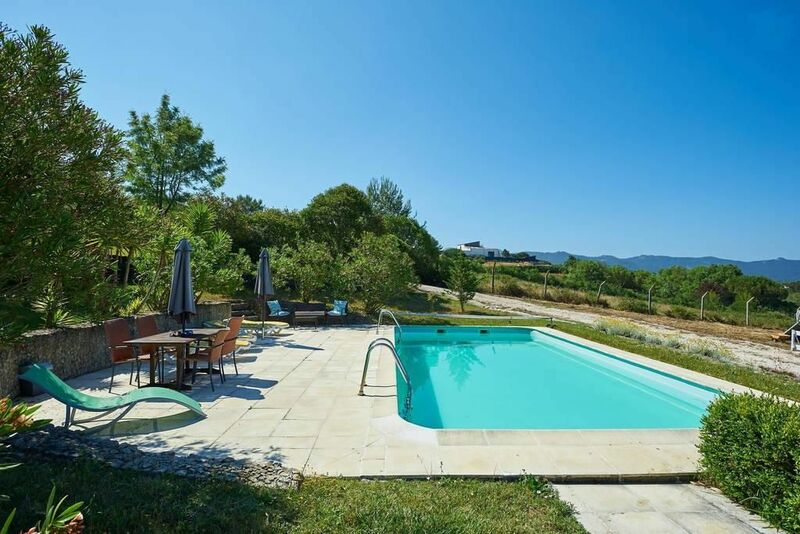 The property also offers various places outside to relax, barbecue, pool, free parking and an organic vegetable garden, guests are welcome to cook their own meals. On request we also offer a cot and / or an extra bed, breakfast and homemade food. Guests are welcome to bring their pet to make their stay even more perfect! We have free Wi-Fi access inside and outside the house. The African Blue Lily Farm concept revolves around tranquillity, relaxation and a close relationship with nature. We believe that one of the best ways to relax is to learn new and different things, so we try to offer activities that can be useful. Our guests will be able to choose from a range of Portuguese tile painting lessons, alternative photo courses, Ayurvedic cooking courses and private surf lessons. We also have a mountain bike rental. These activities take place in our creative room called Casa das Artes. A comfortable room full of materials and perfectly adaptable to your creative needs if you feel inspired. In the heart of nature and 5 minutes from the World Heritage City of Sintra, African Blue Lily Farm offers a unique concept of a holiday where nature, creativity and tailor-made service are the keys to a perfect stay. Our accommodation is located 30 minutes from Lisbon Airport, close to restaurants, supermarkets and other services, yet completely independent of any city. Wonderful views, beautiful beaches, impressive natural and cultural heritage, rich and delicious cuisine ... the richness of this region is greater than the eyes can see and your heart can absorb! - Final cleaning: per object and day to be done by tenant (Mandatory). Pets (per property per day, included 0 EUR). Internet (per property per day, included 0 EUR). Parking (per property per day, included 0 EUR).